The best way to learn how to ride a motorcycle, with 10 hrs. of hands-on drills. 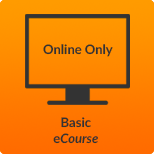 An informative online course; required in some states as part of the hands-on BRC (included when enrolled in either a BRC or BRC2-LW). 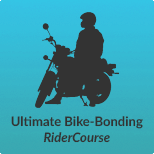 This online course is a key component of the full hands-on Basic RiderCourse, but can also be completed as a stand-alone program without enrolling in a hands-on course. Graphics and videos illustrate the lessons to help you understand principles of motorcycling and determine whether motorcycling is right for you. 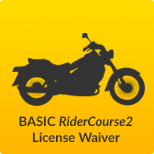 The Basic eCourse alone is NOT accepted as a license waiver by any state's DMV, or as a motorcycle license or learner's permit. With Spanish language option. 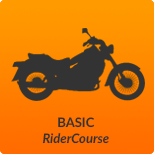 Similar to the Basic eCourse, but for riders who already have some experience. 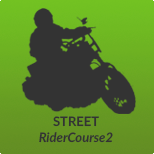 The Street Strategies eCourse is for riders who already have some experience and focuses on street/traffic strategies. 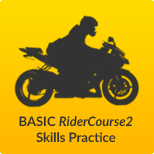 It is similar to the MSF Basic eCourse, but basic learn-to-ride and motorcycle controls content is omitted and overall course time is reduced by nearly half. 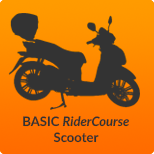 This eCourse alone is NOT accepted as a license waiver by any state's department of motor vehicles, or as a license to ride a motorcycle or as a learner's permit. Both eCourses include selectable Spanish text and audio. In selected states, for riders who already have basic skills but are not yet licensed. Similar to the BRC except speeds are higher and you should be on your own motorcycle. An excellent refresher course for practicing and renewing riding skills. 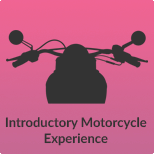 Includes an informal classroom component for discussing safety concepts based on past riding experiences and current knowledge. If you do not need the license waiver component (no classroom activities and no knowledge or skill test), there is a "Skills Practice" offering. 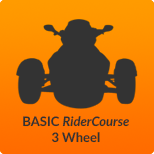 The best way to learn how to ride a 3-wheel motorcycle, with 8 hrs. of hands-on drills. Designed for riders of 3-wheel motorcycles, whether the two wheels are in the back or the front. Successful completion of this course, consisting of five hours of classroom activities and ten hours of on-cycle riding exercises, plus knowledge and skill tests, may waive the license test in your state. The course may also earn you an insurance discount. You may bring your own 3-wheel motorcycle, or one may be provided. The best way to learn how to ride a scooter, with 10 hrs. of hands-on drills. Covers the basics of operating a scooter, including mental strategies and operating techniques. Scooters and helmets are provided for your use. Successful completion, consisting of five hours of classroom activities and ten hours of riding conducted over two or three sessions, plus knowledge and skill tests, may waive the license test in your state. The course may also earn you an insurance discount. For riders who have a permit and basic skills, but haven't been riding for several years. A five-hour riding course designed to help licensed riders develop basic riding skills. Exercises focus on a variety of cornering skills and limited-space maneuvers. By the end of the course, you should be able to handle a motorcycle well enough to negotiate normal street and traffic situations. Motorcycles and helmets are provided for your use. You must have a valid motorcycle permit or license endorsement. 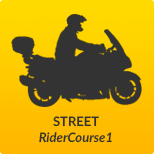 Serves as your first street riding experience, under the supervision of a RiderCoach. For newly licensed riders. Venture out under the supervision and guidance of a RiderCoach, who will be narrating the ride and giving real-time instruction to participants. This half-day program includes classroom activities to assess and improve your perceptual skills, practice time on basic riding skills, and a couple of hours of actual street riding in a local area. 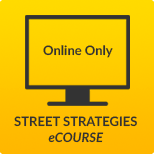 A next-level on-street course focusing on perceptual strategies and maneuvering finesse. A program that enhances the basic skills and strategies that are provided in SRC1 and adds time and mileage to the on-cycle experiences. As in SRC1, the RiderCoach will be narrating the ride and giving real-time instruction to participants. It is best if you use your own street motorcycle, but a training bike may be available. Intensive course that complements your basic skills and helps with risk-assessment. 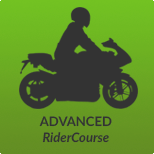 A 5-hr course for experienced riders, modeled after police training courses. There is no formal classroom and the riding exercises focus on limited-space maneuvers, modeled after police training courses. Through progressively challenging exercises, you develop smooth and precise control and learn more about the limits of your abilities and your bike's capability. You must bring a valid motorcycle permit/license endorsement, and an insured/registered/street-legal motorcycle. A 2-hr. first-touch experience with a motorcycle, not designed to teach riding skills. Heartsaver courses are designed for anyone with little or no medical training who needs a course completion card for job, regulatory (for example, OSHA), or other requirements. These courses can also be taken by anyone who wants to be prepared for an emergency in any setting. This Bystander Assistance Program (BAP) is a one-day community education program directed toward motorcycle riders and passers-by. The concept of the program is to teach specific trauma response related to the assessment and treatment of the injured rider as well as how to safely administer care.